The early development of the Carter Ink Company can be traced to the year 1858 when William Carter, a Boston paper dealer, began the sale of writing and copying ink as a side project. This ink – given the name Carter’s Combined – served as a significant innovation in ink-making in that it was not only tailored to the production of copies, but also useable as a general writing ink. Despite its early and important development, however, the production of this ink did not begin to significantly expand until the end of the Civil War. At this time, Carter’s son, John W. Carter, entered his father’s business with salesman J. P. Dinsmore and focused entirely on the manufacture and sale of William Carter’s inks. The success of these inks ultimately resulted in the younger Carter and J. P. Dinsmore occupying a separate office building in Boston and, after 1873, establishing the separate firm of Carter, Dinsmore, & Company (Stone, 1930). By the late nineteenth century – following the retirement of Dinsmore and the untimely death of Carter – the firm was incorporated under the name of The Carter’s Ink Company. In 1909, the company had outgrown its factory in Boston and constructed a new plant on First Street in Cambridge. The new building, whose large electric signs quickly became Cambridge landmarks, included multiple floors of laboratories, storage tanks, and automatic machinery dedicated to the production of ink and ink-related products. The company experienced steady growth through the late nineteenth and early twentieth centuries, introducing such merchandise as photolibrary paste, stamp pads, carbons and ribbons for typewriters, a distinctive line of fountain pens, and several hundred formulations of writing fluids. By 1930, The Carter’s Ink Company, which employed over 500 people, had become one of the largest manufacturers of ink in the world (Stone, 1930). Throughout the 1940s, after having managed to survive both World Wars and the Great Depression, the company continued to experience steady success and growth. It not only founded several branch offices in major cities throughout the world, but also established a six-story branch factory in Montreal, Quebec (Stone, 1930). Living up to its motto that “there is nothing so good that it can’t be better,” the company relied heavily throughout its latter years on the introduction and manufacture of a variety of innovative products to sustain its business revenues (Stone, 1930, pg. 794; Faulkner & Faulkner, 2003, pg. 41). Despite this, by the 1970s, the company began to falter. 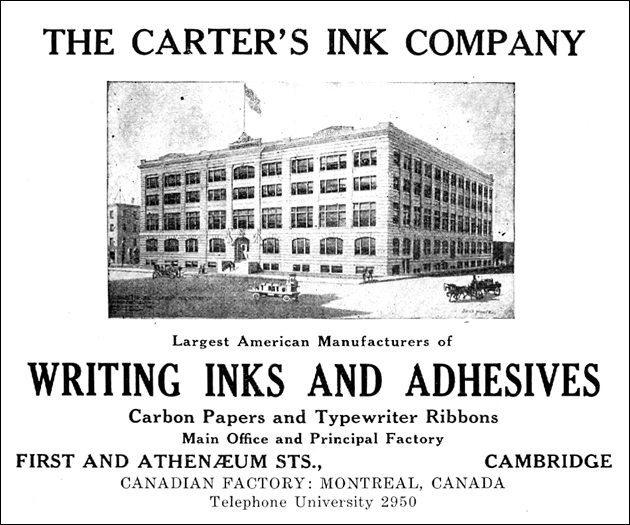 After over 100 years in business, The Carter’s Ink Company was purchased in 1976 by the Dennison Manufacturing Company and moved to city of Waltham, Massachusetts (Faulkner & Faulkner, 2003; Maycock, 1988).